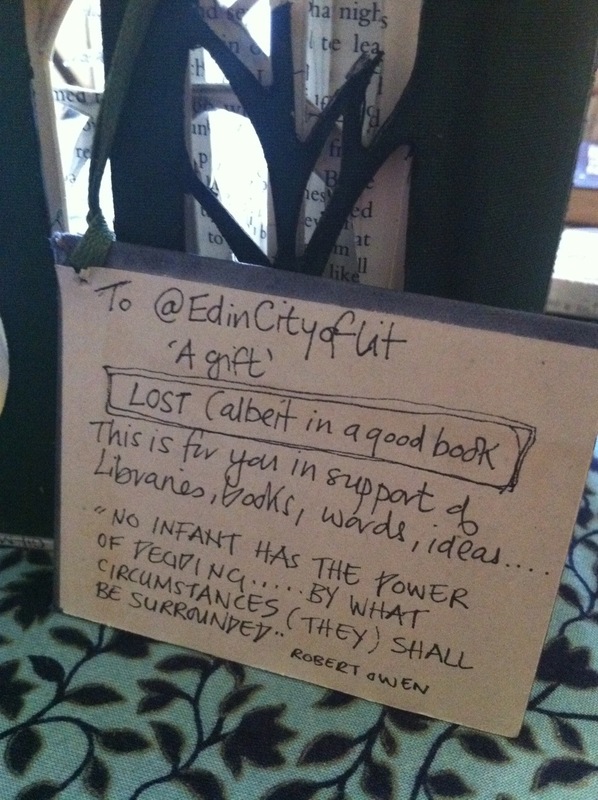 Books may have been read, wine may have been drunk, Alasdair Gray may have been back in town. 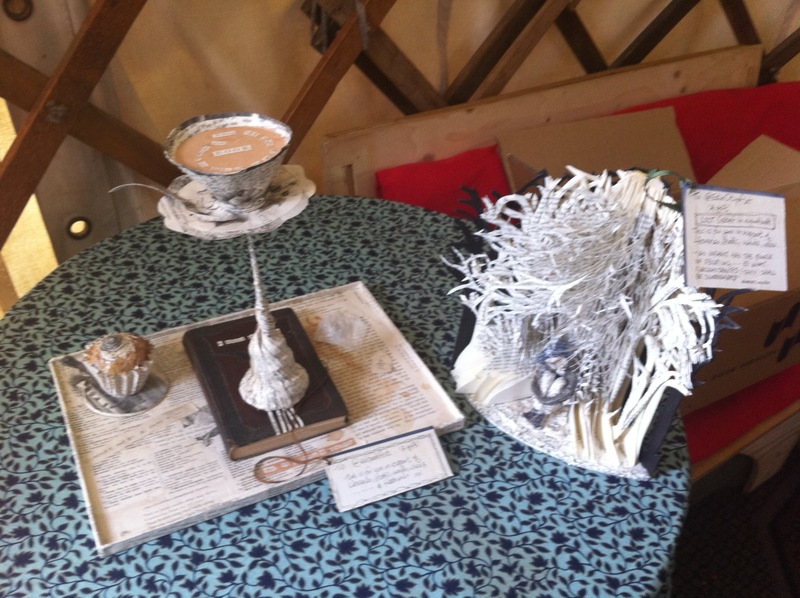 The day, however, belonged to book art, and the story of these secret sculptures. 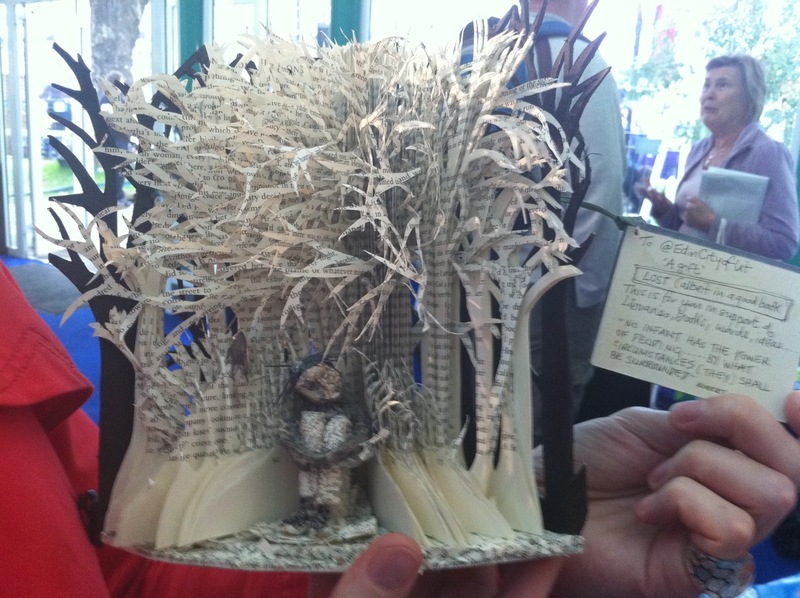 These beautiful book sculptures are gifts from a mystery artist, discovered at the Edinburgh International Book Festival on Wednesday 24th August. Despite the crowded Festival, full of school-children, no-one saw these artworks appear, and we have no idea who made them. 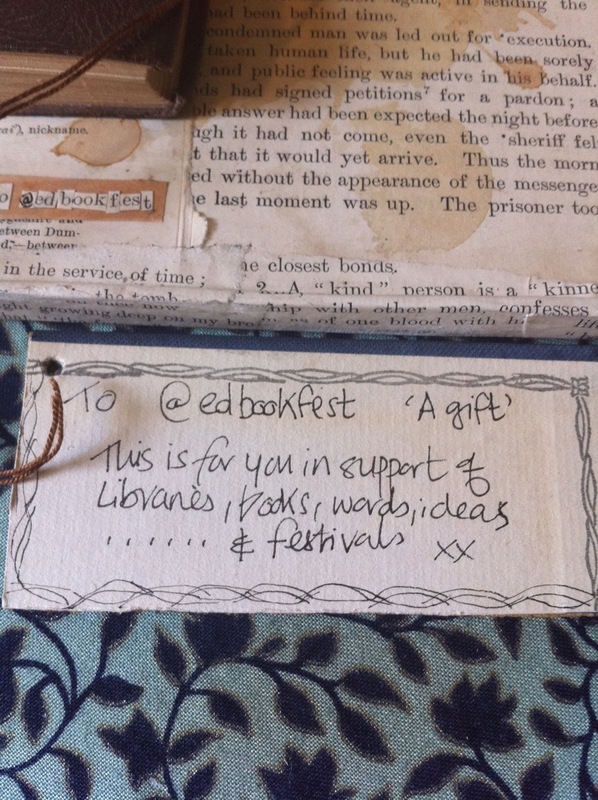 My colleague Ali found our gift on the City of Lit stand in the Entrance Tent, and together we squealed in utter delight as we fell in love with our delicate, heart-felt artwork. We rushed to show Press Manager Frances, and the Press Pod came alive as photographers and Guardian journalists got just as excited as us. Ali and I chatted to The Guardian‘s Michael MacLeod about our find – listen to it here, and watch the slideshow. We look so very chuffed. 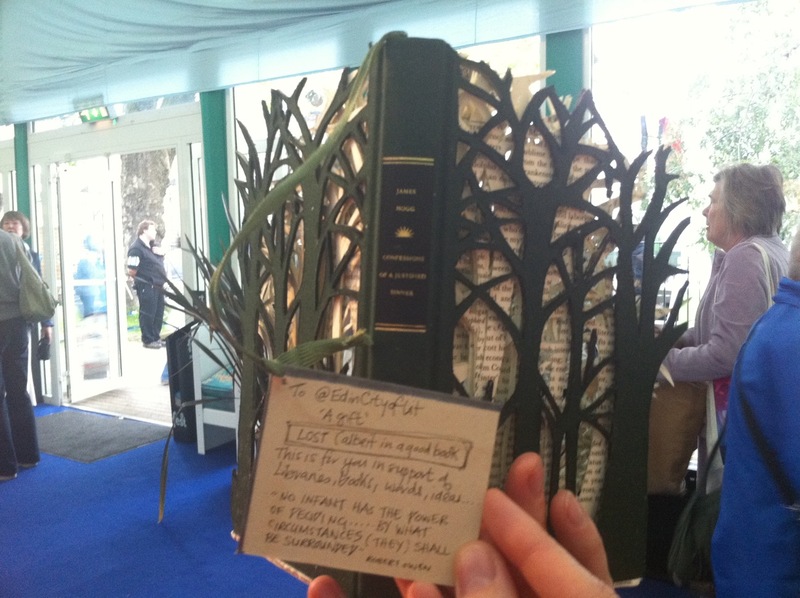 Six book sculptures have now appeared: the Scottish Poetry Library, Scottish Storytelling Centre and Filmhouse each have a treasure and the National Library of Scotland have theirs on display. Several of them are made from Ian Rankin books, but he hadn’t seen any of them in the flesh until today – Chris Scott got a snap of him as I showed our former Trustee the EdinCityofLit sculpture. Literary Paparazzo Chris Scott has photographed all of the book sculptures – see them detail on his Book Sculpture web post. I wore a sensible but stylish navy pair, with pinstripes, and just the right height of heel for running around the Book Fest showing off the stunning book sculpture. My photographer was the Party Impressario Sponsorship Team’s Eli. Having arranged a rematch with Ian Rankin, I didn’t want to wear anything too fancy – girls have nicer shoe options than blokes, and in Round One my patent heels clearly stole the show. Round Two arrived, and I was confident of winning, but I under-estimated my opponent and his secret weapon of patterned socks.